A considerable amount of talent was assembled to make what has turned into a throw-away late summer film. Academy Award winning actors Meryl Streep and Kevin Kline headline the cast while Oscar winners Jonathan Demme and Diablo Cody handle the directing and screenwriting tasks. Yet, despite the embarrassment of riches, Ricki and the Flash never quite reaches the heights one might expect from browsing the credits. It's an entertaining diversion - a good way to pass a couple of hours as late summer evenings lengthen - but not much more. Due in large part to helming The Silence of the Lambs, Demme is known as a dark, edgy filmmaker. Over the course of his career, however, he has directed dramatic movies like 1994's Philadelphia and 2008's Rachel Getting Married. Ricki and the Flash is a cousin to the latter, telling the kind family-oriented story that has fallen into disfavor in an era when interpersonal interaction has become unpopular with studios focused on making a big box office splash. Cody, known for her biting, irreverent dialogue (she won her Oscar for Juno), tones things down considerably. Ricki and the Flash contains a few zingers but, for the most part, it's low-key. This represents a reunion for Kevin Kline and Meryl Streep, who were paired as lovers in 1982's Sophie's Choice. Here, the material is less wrenching. 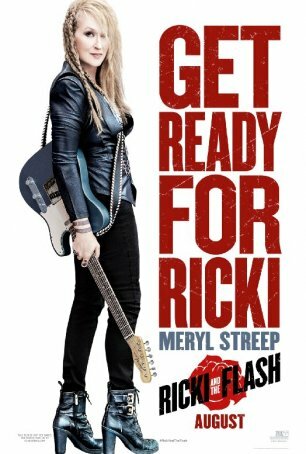 Streep is Linda, a sixty-ish rock singer who fronts a house band, Ricki and the Flash, at a L.A. bar. Her career has long since peaked (and she wasn't that big even when "on top") but she keeps at it because that's who she is. Her pursuit of music has left a lot of roadkill in the rearview mirror: an ex-husband, Pete (Kline), and three children - Julie (Maime Gummer), Josh (Sebastian Stan), and Adam (Nick Westrate). Her present isn't wreathed in glory - she makes ends meet by working as a cashier at a supermarket and rebuffs the advances of her smitten bandmate, Greg (Rick Springfield). Then she gets the call from Indianapolis. Julie, after being dumped by her husband, has tried to kill herself. Now she's holed up in a bedroom in Pete's palatial estate and won't come out. With his wife (Audra McDonald) away caring for an ailing father, Pete has nowhere to turn but Linda, who makes the trip to offer what help she can. Her first encounter with her daughter doesn't go well - long-buried recriminations pour forth - but the two manage to form a fragile bond over the next few days. Things don't go as well with Linda's other children. Josh is willing to engage with her but Adam would prefer to avoid all but the most superficial contact. To the film's credit, it doesn't wallow in the melodrama of the situation. Yes, Ricki and the Flash is about redemption but it's not about a woman making amends for the wrongs she committed against her children. Instead, it's about her trying to reconnect with them as adults and create a new relationship. The key sentiment is voiced by Greg: "It's not our kids' job to love us. It's our job to love them. We're their parents." The movie is mature in the way it handles the regrets of absentee parents and the ways in which their children relate to them. There's a little Hollywood artifice here but not so much that the emotions feel inauthentic. The acting is, of course, top-notch. Although Streep seemingly gets an obligatory annual Oscar nomination, any such acknowledgment in 2016 probably won't come for Ricki and the Flash. She's solid here but the performance isn't flashy enough. In fact, she is out-acted by both her real-life daughter, Maime Gummer (playing her on-screen daughter) and, perhaps surprisingly, by Springfield. Known best as an '80s pop icon, Springfield has developed into a credible actor. August is a month when misfit movies make their way into multiplexes - titles that lack the prestige necessary to compete in the fall Oscar race but are too "small" to make it in the early summer. That description fits Ricki and the Flash. It's a warm story of a fractured family reuniting and finding a way to forge a path forward, but the quality of the cast and crew elevates the material. There's a ceiling for this sort of drama, however, and, while Ricki and the Flash, bumps against it, it can't quite crash through.